Sonia Warshawski (right) speaks with her granddaughter Leah Warshawki. Images by Gloria Feinstein. Kansas City — As a child growing up in St. Louis, Missouri, Leah Warshawski caught only rare glimpses of her grandmother, who lived across the state in Kansas City. Around the time of her bat mitzva, as she helped her father in his quest to transcribe his family’s stories, Leah began to learn of her grandmother Sonia Warshawski’s history as a Holocaust survivor. Now, as a 37-year-old documentary filmmaker, Leah has taken on those stories and more as she works toward completing a new project about her grandmother. 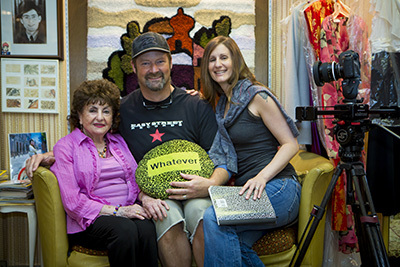 The focus of the film Big Sonia goes beyond the now 90-year-old’s experience as a Holocaust survivor. It speaks to the resilience of this 5-foot-tall woman, who faced not only extermination at the Auschwitz-Birkenau camp but also, more recently, eviction from the tailor shop she had owned with her husband for three decades. Today, she still works six days a week, and spends much of her spare time telling her story to schoolchildren as part of Holocaust education events. Everywhere she goes, she drives her beige Oldsmobile 98, outfitted with a loud, leopard-print steering-wheel cover. The process of making the documentary has brought granddaughter and grandmother (both members of Hadassah) closer. Leah says she not only has come to know her grandmother better—they used to see each other only a couple times a year—but also now understands the forces large and small that helped shape her. (from left) Sonia, Todd Soliday and Leah. Leah, who now lives in Seattle, first got into filmmaking because of a chance encounter while working on a boat in Hawaii as a Japanese translator for tourists. She met a crew member working on the Baywatch television series, and eventually found work on shows such as Lost and Survivor. “What interested me the most was telling stories and meeting people who trust you with their stories,” Leah said. “That’s why I ultimately chose to make documentaries.” She and Soliday met while making Finding Hillywood, about Rwandan filmmakers trying to help the country heal following genocide. For her part, Sonia decided to start telling her own story publicly about 20 years ago after struggling for decades with survivor’s guilt. Sometimes she would hear a joke and laugh, but then stop herself. “How can I be happy, when I’m remembering the ones who couldn’t make it,” Sonia recalled thinking to herself. But she had an epiphany when she began to hear about skinheads who were denying that the Holocaust had happened. “It was just like a thunder entered my brain to tell you, ‘Hey, Sonia, this is the reason you survived, to go on and tell your story,’ ” she said with a heavy Polish accent. Sonia grew up in eastern Poland in Międzyrzec, a town known around the world for its manufacturing of bristle brushes. At the start of the war, some 12,000 Jews lived there, comprising about 75 percent of the population, but only 1 percent survived, according to Holocaustresearchproject.org. In 1942, when she was 17, the Nazis forced the Jews—including Sonia, her parents and her brother and sister—into a ghetto. Her father, brother and sister were able to escape at different points, but eventually Sonia and her mother were sent to the Majdanek death camp, where she watched her mother being sent to the gas chamber. Her father and brother were also killed during the war. Sonia experienced all kinds of horrors as the Nazis moved her from Majdanek to Auschwitz and then to the Bergen-Belsen concentration camp. She watched other prisoners tossed into holes with feces; witnessed the hanging of two girls who tried to escape; and even got shot accidentally through the chest as the British army liberated Bergen-Belsen. She said she recovered in a hospital the British set up in the converted SS barracks. She met her husband, John, at a displaced persons camp, and with the help of the American Jewish Joint Distribution Committee, arrived in Kansas City in 1948. They opened the tailor shop and had three children. These days, Sonia regularly talks at local schools, libraries, churches, books clubs and even prisons. She delivers her story in a determined manner, as though it’s something she needs to tell you right away. The film shows Sonia talking to middle school students and, separately, to inmates at a prison. It includes interviews with audience members, talking about the impact Sonia’s story had on them. Caroline Kennedy, a graduating senior in the Kansas City area, said she was inspired to launch Empower: Educate and Inspire, a nonprofit dedicated to educating young people about global issues, a few years after hearing Sonia speak. At a recent screening event to raise funds for the film, she took the stage to read a letter to Sonia. No matter how compelling Sonia’s Holocaust story is, the filmmakers saw it as much more than that. Sonia’s story is not just about surviving the Holocaust, but also “modern-day survival,” Soliday said, alluding in part to her being evicted from her tailor shop. Sonia received a letter from her landlord in the summer of 2014, notifying her that the company planned to tear down the once-popular mall where her store, John’s Tailor Shop, had thrived for more than 30 years. She and her husband had run the store together but she had slowly taken over more of the business as he suffered from Parkinson’s disease. He died in 1988. A mall security guard who had been a longtime friend reached out to the property owners. They had another building about 10 minutes away where they allowed her to rent space. A few weeks after receiving the eviction notice, family and friends helped her pack up the machines, zippers and threads. Sonia said she spent about an hour each night for weeks calling longtime customers to notify them of the relocation. Her new store is filled with colorful fabrics and a number of stations where she and her employees sew. Each time she is asked to speak about the Holocaust, she said, she has to make sure someone can cover for her at the shop. “You have to stay busy. I really cannot tell anyone what they are supposed to do, but in my case, this is my lifeline,” Sonia said during a recent visit by her granddaughter. Soon, Sonia began talking politics and expressed frustration with world events. Leah has become accustomed to these conversations. She has made more than 15 trips from Seattle to Kansas City over the last three years. She follows Sonia to speaking engagements and around town, including to a fish market where she picked up ingredients to make gefilte fish. The film is near completion and its rough cut has begun to make the rounds at film festivals, including being shown this spring at the Bentonville Film Festival, the Arkansas event cofounded by Geena Davis, and at the Seattle International Film Festival. Through the process of making the film, Leah has been continually reminded how the Holocaust has shaped her grandmother’s worldview. “It’s the underlying theme of everything with survivors,” Leah said. “No matter what happens in a day, everything comes back to the Holocaust. Eric Berger is a staff writer at the St. Louis Jewish Light and has written for publications including Vice News, the Philadelphia Daily News, St. Louis Magazine and the Jewish Exponent. Thank you for profiling BIG SONIA! We’re excited to complete the movie this summer and make a #BigImpact. Please join our mailing list if you’d like updates on the rest of our “journey” with the project. Amazing woman and a role model for all women. This sounds like a remarkable documentary about a remarkable woman who tells her story. I live in KC and of course know of Sonia. I’m excited to see the film. I really enjoyed reading this story. Sonia is an amazing woman and an inspiration to me. I can’t wait to see this documentary.